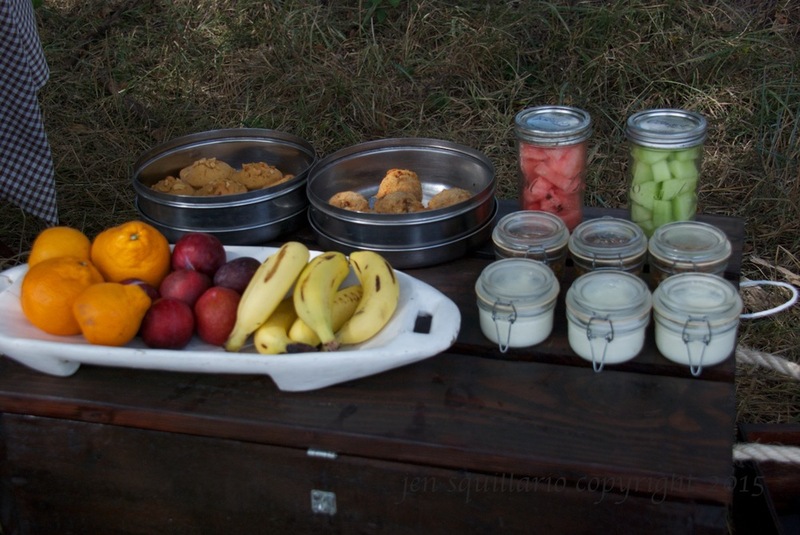 The first time we went on safari, our guide asked us what we wanted to see. We responded "a kill." We didn't understand what we were asking for, but the closest we had been to this part of the world was what we saw in National Geographic movies. And, those movies always made "the kill" look exciting, maybe even fun, and surely satisfying. So, the second time we went on safari, we chose a location in Botswana where it is highly likely that you will see a lion kill a buffalo. And, we did. The photos and details from that bloody kill will be the subject of a future blog, but we learned that what you really want to see is "the hunt," not necessarily "the kill." "The kill" is vital; "the hunt" is electric. "The kill" takes a life; "the hunt" is pure energy. Seeing a predator map out how she is going to get her next meal and then execute on that plan is a thrill ride. But, when she catches her prey, and you see the fight for life, the terror in her prey's eyes, and just how long it takes for the prey to take its last breath, you learn it's "the hunt" and not "the kill" you are looking for. And, you learn that National Geographic does some good editing. Day 5, morning drive. 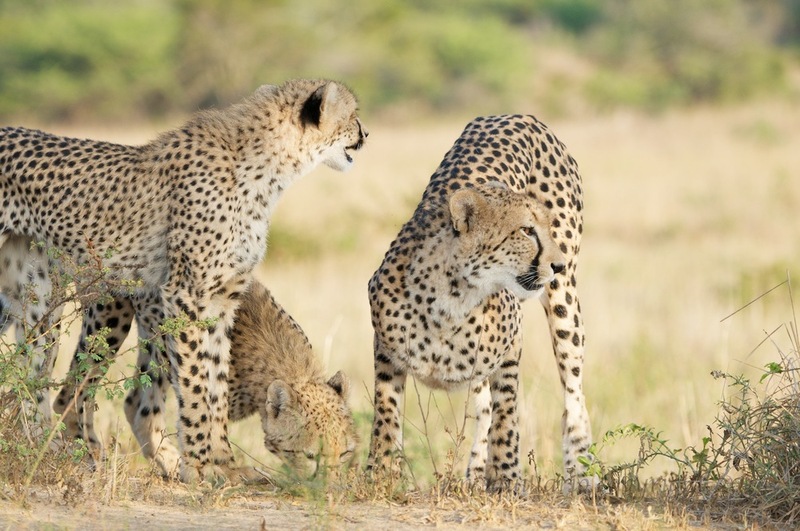 After a valiant attempt (which means much hacking and maneuvering) to track a lioness and her cubs, we changed course to find a cheetah and her two cubs--a different set of cheetah than we had seen previously. 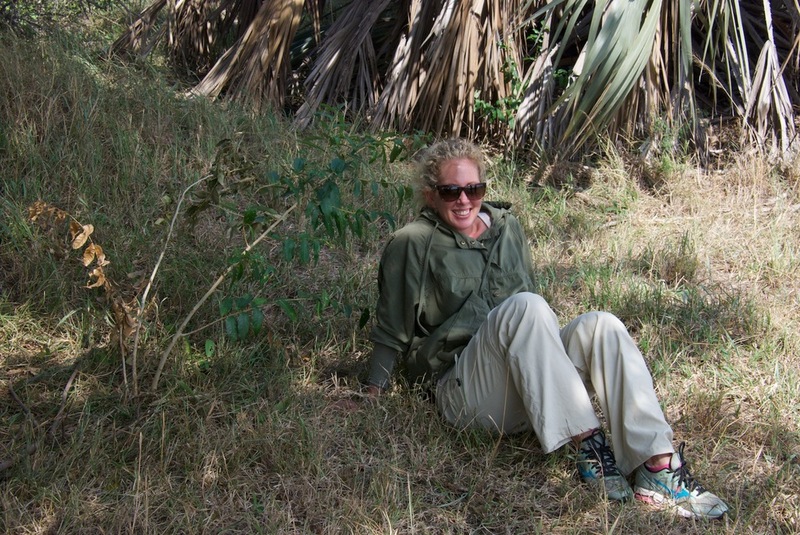 Giles and Able dealing with a stubborn tree while tracking the lioness and cubs. I'm pretty sure Able was laughing the entire time. Before I even could comprehend that the two young cheetah had moved, they were off after a scrub hare, with mom following. It happened so fast that my untrained eyes had trouble understanding what was happening until Giles clued me into the action. There was a scrub hare running, with two cheetah close behind, dust flying. The hunt was on. Before my eyes could catch up, the scrub hare had found a hole to dive into escaping "the kill." I'm not sure if I actually ever saw the scrub hare, or my imagination created a memory of a scrub hare running for its life. The young cheetah look down the hole for their scrub hare. Day 5, evening drive. 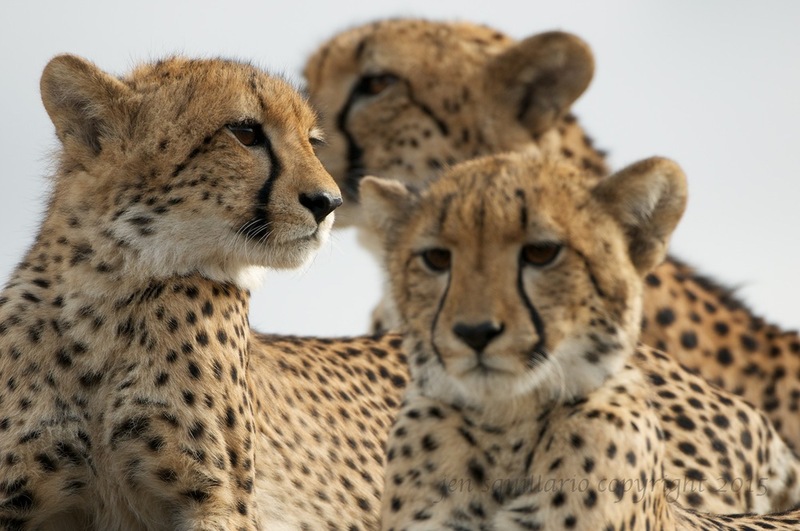 We headed back to the cheetah to see if they had been successful in securing themselves a meal. Though I couldn't see a thing, it didn't take Able and Giles more than 10 minutes, if that, to locate mom and her two cubs. After a few tense minutes, mom decided to abandon her route toward the brothers and turned back as the sun set. Another great day on safari came to a close, leaving us to wonder if the next day would bring a successful hunt by mom and her two cubs. After inspecting the hole, mom's demeanor abruptly changed--serious and alert, and the kids followed suit (photos to scroll through). Mom then perched herself on a termite hill, looking for prey. What she saw was a male nyala. Prey that should have been too big for her to be interesting or worth the effort. As this photo shows, if it were a prize fight, the nyala and cheetah would not be anywhere close to the same weight division. Giles had moved us a bit farther away from the cheetah in case she decided to hunt. In an instant, the cheetah took off for the buck, and my heart rate increased two fold--the excitement of the hunt. But it was not to be, and I felt remiss for the cheetah, but relieved for the nyala. Given the size of the nyala, it was a surprise to our guide/tracker team that she went for it. But, hunger makes you do reckless things (like eat a whole bag of potato chips). And, to sprint at full speed in the heat without success is reckless for a cheetah. She was tired, but still hungry. So, she found some shade to gather her strength and regroup. Mom resting while being reminded that her cubs were still hungry. One of the cubs must have sensed that mom was spent, and she decided that she would take care of things on her own. Not far from where mom was resting was a herd of wildebeest. A full grown wildebeest is big; too big for mom; too big for a cheetah cub. 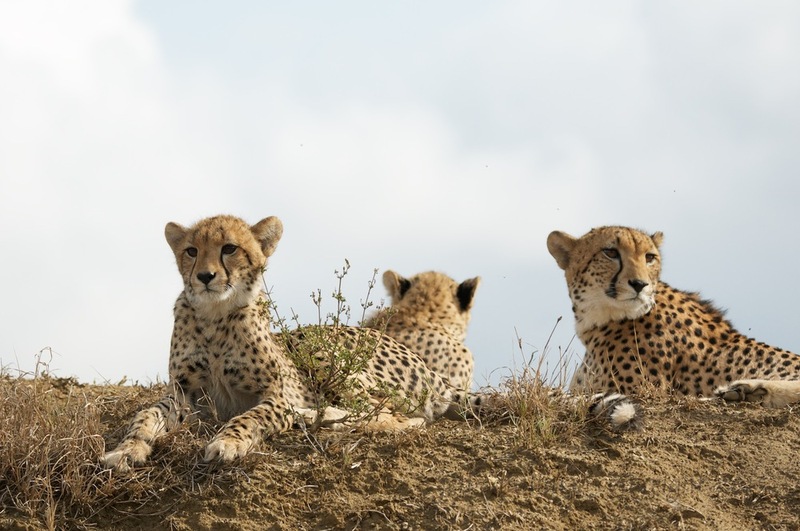 Cheetah cub spots the wildebeest herd. But with youth comes a sense of invincibility coupled with stupidity. The idea that you are smarter and stronger than your elders, who have way more experience and muscle mass than you do . . . . So, the young cub took off after the wildebeest herd, and mom followed reluctantly. Luck often reinforces a bad idea, making it a good idea. 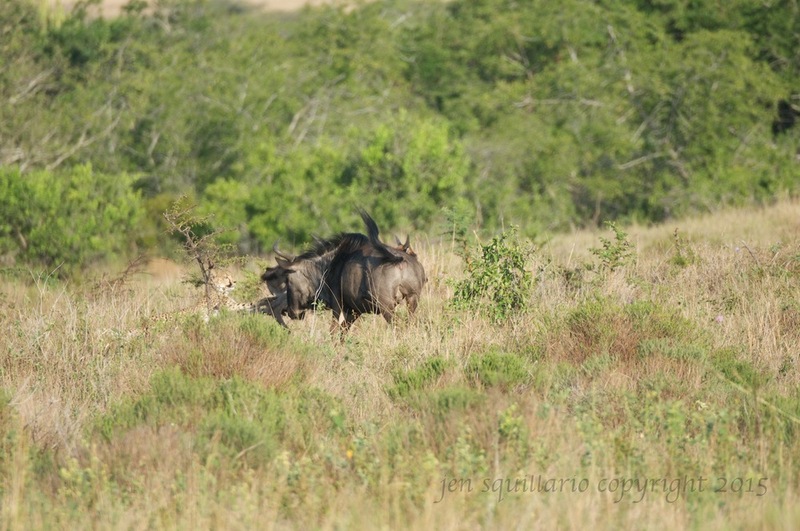 And, what we didn't see (and what the cub didn't see initially) was that with the herd was a young, small wildebeest. The cub fleshed out the young wildebeest and the chase began, with mom following halfheartedly with, what appeared to me, an almost shocked expression. And, though I have a few not so good photos and a video that I'll share here for purposes of the story, I forgot to pick my camera up for most of the chase, and Ian kept putting down the Go Pro like he forgot its purpose. I was enthralled. It was electric. Before I knew it, the young cub was on the wildebeest, and I was torn. Half of me said kill it! And, the other half knew that if the cub was successful, there would be tears. The young thing was bleating loudly as the cub got near, tearing at my heart strings. But then the wildebeest herd came for their own, led by the young wildebeest's mom, and charged the cheetah, distracting them from the chase, ultimately pushing off the cheetah. I was both relieved and disappointed. There would be no kill this morning. This trip was our first attempt at video, and we have a lot to learn still (apparently, we need to watch more of those National Geographic movies). If I had edited the video and zoomed in, you would get a nice view of the wildebeest running, but then I would have lost the view of how thrilled Able gets (sitting in the passenger seat). His excited smile is the perfect visible of the thrill of the hunt, as Giles yells out "unbelievable; can you believe it!" (turn the volume up). 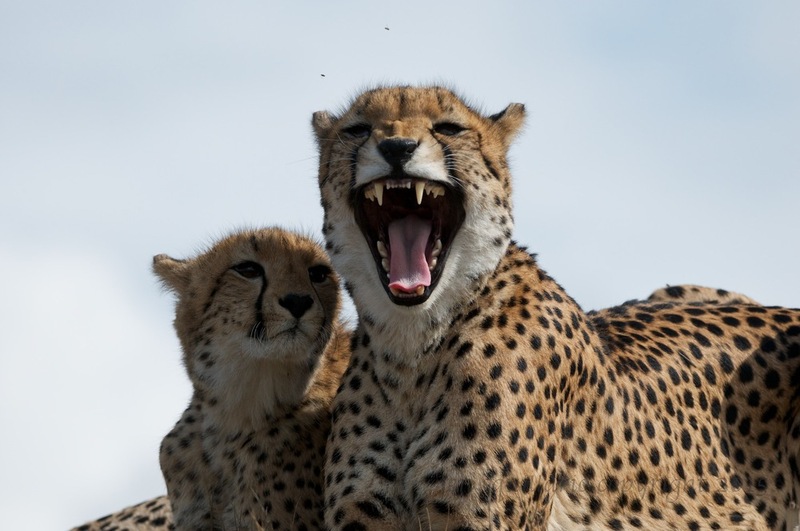 As you follow Able's hand, he points out where the young cheetah is chasing the wildebeest, and you get a good perspective of the speed at which they are moving. 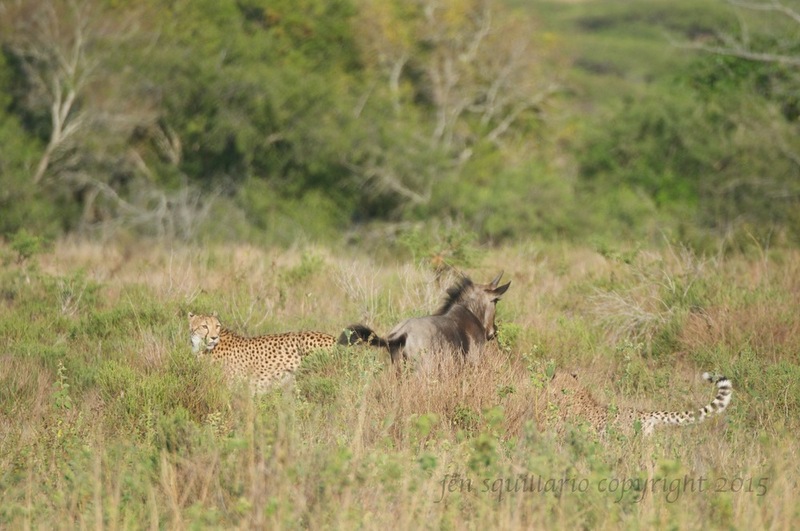 You will also hear the bleating of the wildebeest as the young cheetah makes contact. Then, you will see the wildebeest herd come from two directions to save its calf, as Able gives them a round of applause. Young cheetah chasing wildebeest with mom looking on. Cheetah cub on the tail of the young wildebeest. The wildebeest's mom comes back for its young. And, she successfully shakes the cheetah from her young. Despite my preference for the hunt, which really is a bit cliche--the whole thrill of the chase/hunt thing, writing this post and looking at my photos and the video makes me wish we had seen the kill. Eventually, mom and her cubs surely were successful, probably later that day. And, really, what is the point of the chase and the hunt without the kill! Just another reason, not that I need any, to return. *FYI - This trip was planned by our wonderful travel agent, Jeanie Fundora at www.travelbeyond.com. 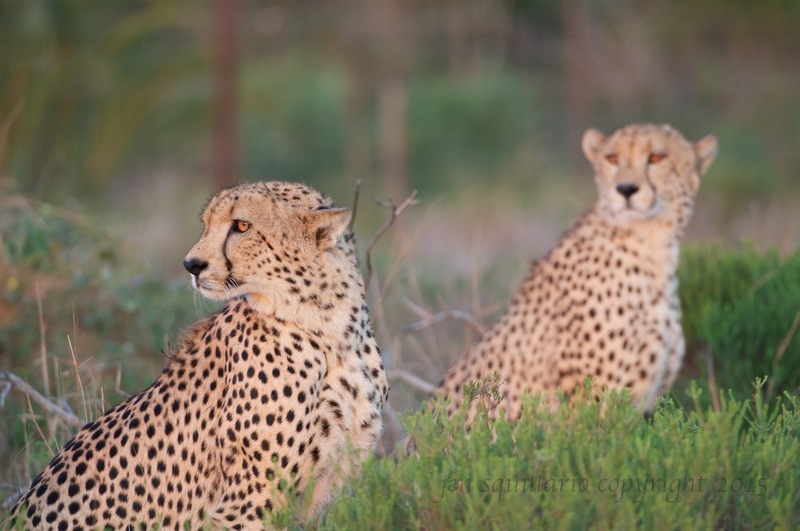 ** From Phinda's Eco Guide on their cheetah: "Cheetah were among the first large mammals to be reintroduced at &Beyond Phinda when the reserve was created in 1992. 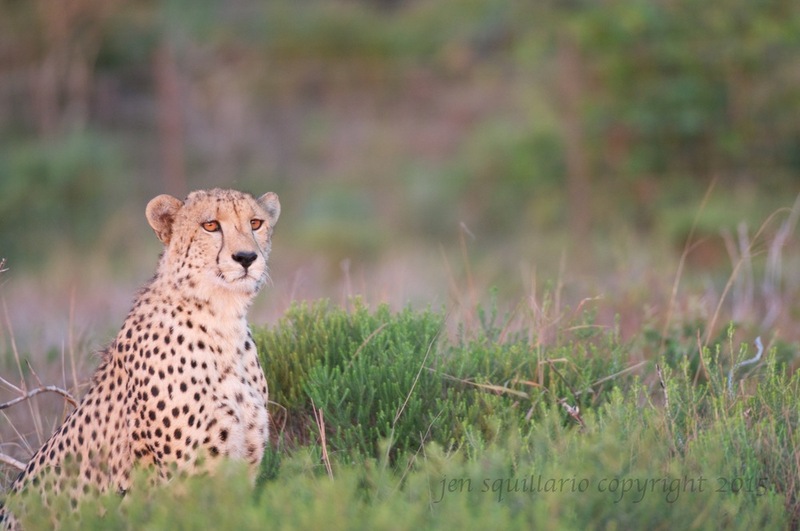 At the time there were no successful examples of reintroductions elsewhere in Africa, so it was a major challenge to bring these elegant cats back to a part of the country where they had not been seen for some fifty years. Beginning with an initial population of six, numbers have remained stable at between twenty and thirty individuals over the past five years. A total of 124 cubs have been born since 1992, with 70% of these surviving independence and the majority being relocated to other wildlife reserves. 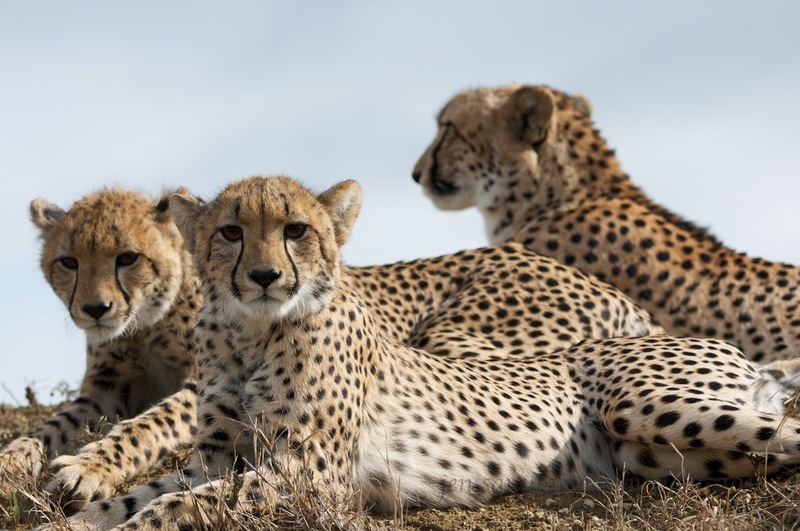 This is in sharp contract to the 95% mortality rate of cheetah cubs in the Serengeti-Mara, where predation by spotted hyena and lion is so intense. 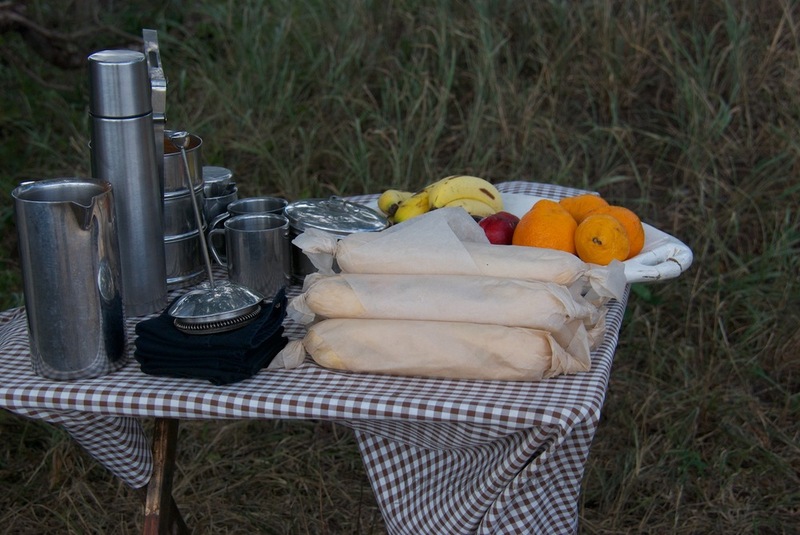 The greater cover and smaller numbers of hyena at &Beyond Phinda may be responsible for the cheetah's success here. 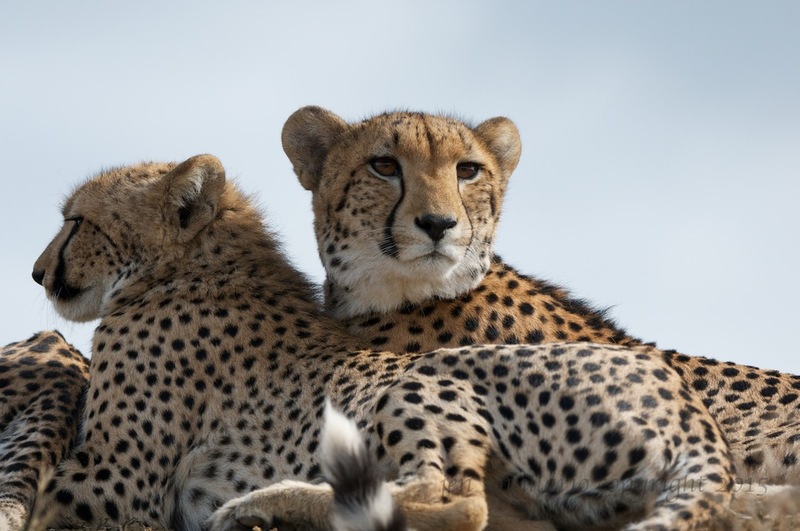 Today &Beyond Phinda offers some of the best opportunities anywhere in Africa to view and photograph these speedy cats."